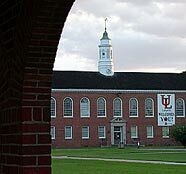 UL Lafayette’s commencement schedule for the Fall 2005 semester includes venue changes for several colleges. On Dec. 17, students will graduate in Blackham Coliseum, Angelle Hall auditorium and the Student Union Ballroom instead of the Cajundome and the Convention Center. The latter venues served as shelters for hurricane evacuees and are unavailable for commencement ceremonies. 9 a.m. ....................College of General Studies. 11:30 a.m.. ............College of Liberal Arts. 9 a.m. ....................College of Nursing and Allied Health Services. 2 p.m. ....................College of Engineering. 2 p.m. ....................College of Sciences.